As a wife and working mother, Roslyn Jaffe recognized a need for women in the workplace because it was a need of her own – a one-stop-shop where women could buy designer clothing at a discount. At the time, the idea of offering “fashion at a value” was totally unique. And the rest, as they say, is history…our history. Roslyn and Elliot Jaffe met and fell in love while working for rival retailers. They got married in 1952 and Roslyn (aka Mrs. J) chose a pink, ankle-length gown she bought for $39. During a time when “tradition” was the norm, Mrs. J was anything but. A few years later, she started something that would change both of their lives forever. The first store opened in Stamford, Connecticut in 1962 and it broke all the rules of retail. There was a lack of convenient parking, only a few dressing rooms and a stairwell customers had to climb in order to access the store. But despite these shortcomings, it was an immediate success. It was the night before the first store sign had to be printed and the Jaffes still hadn’t thought of a name. So Mrs. J thought of two words, “dress” spoke to women (and what they were selling at the time). And in those days, “barn” spoke to discount or value. It was that simple. In the early days, Mrs. J would drive to different warehouses to look for new product, negotiate with sellers and load up her station wagon. One time, while driving back from NYC, she got a flat tire on the George Washington Bridge and a police officer became very suspicious of her packed car. Not only did Mrs. J refuse to get out of the car, she somehow convinced the officer to unpack all the boxes, retrieve her spare tire, change the tire, and send her on her way. One of our first offices was located in a warehouse…and it was exactly how it sounds – brick walls, hardly any windows, etc. So when our HQ moved to its current location in Mahwah, NJ, we made a few changes. The entire building is bathed in natural light and is Gold LEED certified, reducing our carbon footprint and our operating costs. It’s also beautifully designed to represent the brand and our commitment to fashion. 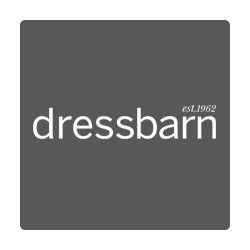 For over 50 years, dressbarn has evolved to meet the needs of modern women, offering them options that have surpassed just dressing for work. Today, we dress them for life. Not only have we remained a fashion destination for working women, but we’ve ensured Mrs. J’s original vision of offering “fashion at a value” has stayed at the core of our brand.